The team that simply was supposed to be happy to be here was crushed to leave. Loyola was dressed in Cinderella sparkles throughout March, the unlikely underdog with a No. 11 seed that managed to pull off magical upsets. But the Ramblers will tell you — they showed us — that they were talented enough, competitive enough and definitely wanted more. From March 2 when they tipped off the Missouri Valley Conference tournament en route to a league championship to the final day of the month on Saturday night that ended with a 69-57 Final Four loss to No. 3-seed Michigan, the Ramblers defied expectations and changed the perception of the program. The Ramblers, who had victory within grasp, imagined themselves where few others did. This time there was no miracle shot or heroic comeback, and it stung deeply. It’s why Marques Townes sobbed in the handshake line. Why Ben Richardson hid his face under his jersey leaning on best friend Custer for support. Why Donte Ingram’s perma-smile was missing for the first time this March, replaced with an expression of resigned disbelief. 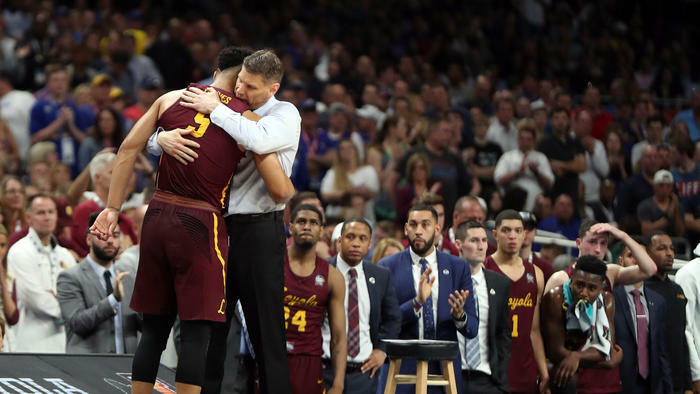 Why coach Porter Moser took several deep breaths during his postgame news conference to collect himself. Custer allowed himself to contemplate the magic that Loyola spun during the NCAA tournament. The team was a national favorite for its upset victories and, of course, 98-year-old chaplain Sister Jean Dolores Schmidt. It’s a team that will be remembered, players said, recognizing their rise from obscurity to celebrity. Loyola (32-6) was out of character during stretches, especially a sequence in the second half where the game slipped away with five straight turnovers. The Ramblers had 17 miscues for the game. Loyola, which averaged 15.8 assists per game, had only six against Michigan. Then there was 6-foot-11 forward Moe Wagner who scored 24 points with 15 rebounds, including six offensive boards, while also burying three 3-pointers. Townes (eight points, seven rebounds) injured his left quadriceps with about 71/2 minutes left, leaving limping but returning a couple of minutes later. Freshman center Cameron Krutwig scored a team-high 17 points with six rebounds but also suffered six turnovers. His three-point play to start the second half and provide Loyola with a 32-22 lead allowed Ramblers fans to believe this team could pull off an upset once again. “Obviously tonight we didn’t execute the game plan,” Richardson said. Next season’s team won’t have Richardson, Ingram or Aundre Jackson. But it will have a legacy. Moser checked his seniors out of the game one by one, meeting each on the sideline with a handshake and a hug. Sister Jean was pushed to the side of the court yet again at the end of the game, where this time she met and consoled players instead of greeting them with celebratory hugs. She left them with a gem of perspective. 0 Response to "Loyola's NCAA tournament run ends with 69-57 loss to Michigan in Final Four"